Jason William Simontacchi was born on November 13th, 1973 in Mountain View, California. 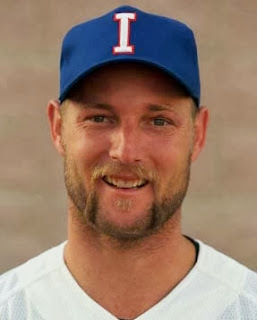 The six foot two right handed pitcher attended Albertson College then San Jose University, where he was picked in the 21st round of the 1996 draft by the Kansas City Royals. He pitched for two years in the Royals minor leagues, but then moved on to the Frontier Independent League in 1998. That season he was the leagues pitcher of the year, as his team won the championship as well. He moved on to pitch in Italy in 2000 & appeared on the Italian Team Italy Baseball Team in the Olympics at Sydney, Australia. He beat South Africa but took a loss to the Netherlands. 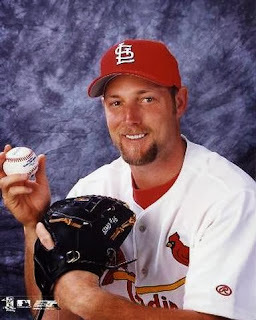 In January 2002 he signed with the S. Louis Cardinals & got up to the big league team by May. On May 4th he made his MLB debut, pitching seven innings against the Atlanta Braves. He gave up two runs & earned his first career win. He would pitch into the seventh inning or beyond in three of his next four starts, getting to 4-0. On June 15th he won an interleague game against his original team that signed him, beating the Royals to get to 5-0. He took his first loss at Wrigley Field on July 3rd, & it was the first time his ERA reached the three mark. He went on to win 11 games (second on the staff to Matt Morris)going 11-5 with a .688 win loss % (7th in the NL) 4.02 ERA for Tony LaRussa's first place Cardinals. He did not pitch in the post season, as the Cards beat Arizona, but lost in the NLCS to the San Francisco Giants. 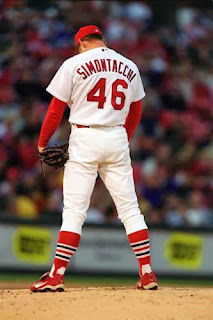 In 2003 Simontacchi went 9-5 but his ERA rose to 5.56. In 2004 he went to the bullpen but suffered a torn labrum which would eventually ruin his career. He was released by the Cards & went to pitch in the Independent League with the Bridgeport Bluefish in 2006. In 2007 he was a non roster invitee to the Washington Nationals camp & made the team. A groin injury sidelined him again, but he got back up to the majors in May. He went 6-7 upon his return but an elbow injury set him back once again. He appeared with the 2007 Long Island Ducks in another Independent League, never getting back to the majors. In a four year career he was 26-17 with a 6.37 ERA, 191 strike outs 125 walks in 96 games. Retirement: In 2013 he became pitching coach for the St. Louis Cardinals A ball Peoria Chiefs.